As part of Electric Ireland’s Sponsorship of Team Ireland for the 2016 Olympic Games, we have teamed up with Olympic Diver, Ollie Dingley to create a short video outlining his story and revealing where he finds his Power Within to achieve his Olympic dreams. Oliver Dingley has revealed that his tenacity and self belief inspired him to be relentless in pursuit of his dreams. As a child, Ollie struggled with shyness; however, he used diving as his solace to allow him to escape into a world where he could express himself openly and ambitiously. No matter how much he struggled during the day at school, in the evening, he would go diving and do something he loved which gave him great motivation to succeed. Ollie has admitted to struggling with confidence and doubting his ability during competitions, and believes that the positive power of the mind is crucial to achieving successful performances. Now, as he prepares for the 2016 Olympic Games in Rio, Ollie is confident in his ability and will use his inner strength and Power Within to achieve his dream of competing in the Games. To see his story, watch his Video and share it using #ThePowerWithin. The Power Within is about giving Team Ireland athletes a platform to tell their own stories of how they have overcome disappointment and used their self belief to realise their dreams of becoming an Olympian. Each and every member of Team Ireland have reached within themselves to unearth The Power Within. Our ambition is that these stories will inspire the Irish nation to look within themselves to find their own Power Within; whether it’s the strength to plough through the final kilometre of a 10km run or find the courage to go for that job promotion. Thanks everyone and keep an eye out for more exciting Team Ireland initiatives, competitions and updates! A pair of gents glasses were accidently picked up in gents toilets on 1st floor D Block. Can they be left at reception. Joe Doyle, father of our former colleague Paul Doyle (formerly GWM Strategy & Regulation and ESB International PSS team) has passed away. Reposing at Keohane’s Funeral Home, Copley Street. Rosary on Wednesday 13th at 6.30pm. Removal on Thursday 14th at 7pm to Our Lady of Lourdes Church, Ballinlough. Requiem Mass on Friday 15th at 11am followed by burial at St Finbarr’s Cemetery, Glasheen Rd. Our thoughts are with Paul and his family at this sad time. The death has occurred of Mary Denning, sister of Brendan and Ciaran Walsh, St. Margarets Road, Finglas. Arrangements: Removal on Wednesday morning to St Mary’s Church Navan, arriving for 10 o’clock funeral mass, followed by cremation in Glasnevin Crematorium. The on Thursday evening last. A beautiful summer’s evening was matched by the surroundings of the Cricket pitch in College Park T.C.D. for a game against an Evening Herald eleven. Having won the toss, ESB elected to bat. An all round team performance delivered a defendable score of 124 to ESB. Some good performances were provided by Vikas Bhagaur 20 runs, Koustav Modak scoring 23 after hitting a four to bring him well over the obligatory retirement score of 20. Also Malkit Singh’s score of 20 helped to secure a comfortable total for ESB. A leisurely second innings on this bright summer evening was being looked forward to by the ESB side. However the Evening Herald eleven had other ideas. The Herald opened the second innings with a strong partnership operating between the opening batsmen, who began to put a solid foundation down for the fight back. Wickets did fall and batsmen retired but all the while the 125 runs required was looking increasingly achievable. Koustav, John Small, Malkit and Vikas all sharing the wickets. It came down to the last over with Koustav to bowl. If scores could be kept to singles then ESB would be victorious. Standing like a gunslinger from an old Western movie, Koustav considered for some moments the distant wicket. The ball was bowled and struck the wicket between Off and Middle stump. There was a collective cheer and sigh of relief from the ESB eleven. The Evening Herald were all out for 117 runs with 19.3 overs bowled. ESB CC will continue to play over the summer, as ever new members are welcome. Previous playing experience is not a requirement. A welcome to new and existing members to with Black Belt Andre Ramos starting tomorrow 12th July. The final results are in and with only 2 people correctly predicting Portugal to win the competition it went down to the wire. In the end only 5 points separate the top 6. Our winner is Paul Prendergast on 72 points. Paul had an overall success rate of 57 % and correctly predicted the 2 finalists, however he backed France for the title. This didn’t matter in the end as he beat Padraig Ryan to the post by 1 point. Padraig finished on 71 points and claims our second place prize. With the highest success rate in the competition of 59 % it was the group stage points which carried him through. At the other end of the table, Pat Joyce and Eamonn Farrell fought off some tough challengers to claim the joint wooden spoon! Check out the table here to see how you finished up. A huge thank you to everyone who got involved with the competition! We have raised €890 for Electric Aid, and had some fun along the way. 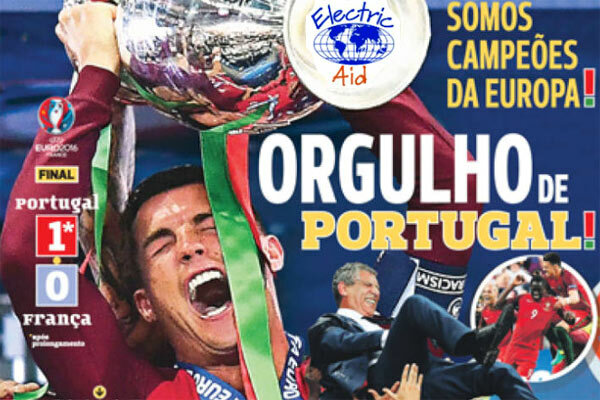 Why not check out the website electricaid.ie to see the types of projects this money will be spent on. Once again, the good name of the community, charity and voluntary sector in Ireland has been damaged by the dishonourable and corrupt actions of a few people. The governance failures and breaches of trust uncovered in Console’s affairs have cast a shadow over many ethical and committed people and organisations. In these circumstances it is necessary to reassure our members and supporters about ElectricAid’s governance, processes, and integrity. We take these principles seriously – and live up to them. Our application, evaluation, funding and project auditing processes are treated with the utmost transparency and integrity. Our payments are governed by a strict approval process with multiple signatories required for cheques and EFTs. As a result of the generosity of ESB, we pay no salaries or expenses. Neither do we pay salary, expenses or overheads for applicant organisations. All of our funding goes direct to grassroots projects. Integrity, transparency and accountability are core values for ElectricAid. No Committee member is reimbursed for work done. Our accounts are independently audited, published on ESBnet and on www.electricaid.ie, and lodged with the Revenue Commissioners and with the Charities Regulatory Authority. Financial and governance details on ElectricAid are published on www.charitiesregulatoryauthority.ie. The minutes and outputs of all meetings are posted on our site. As my predecessor John Kelly noted in similar circumstances in 2013, members have a standing invitation to attend any of our meetings. We are a member-owned and driven organisation, doing our business in the open, and proud to do so. We are open for business – and open for any scrutiny. Please be assured that the unacceptable actions of a few individuals have no place in the vast majority of charities – and absolutely no place in ElectricAid. Members have invested us with the trust of managing and growing this world-leading initiative; we have honoured this trust, and will continue to do so. LEUKEMIA AND A FUND HAS BEEN SET UP TO HELP THE FAMILY. Sum of money found on 2nd floor (Print Bay 2B). Happy Friday everyone! Check out all the latest specials in Urban Day Spa @ SPORTSCO. FREE PARKING for the duration of your treatment. Our Captain Pat O’Shea is looking forward to a big turn out at his home course this Wednesday the 13th of July . The tee is booked from 2.30PM to 4.30 pm and again we ask you to be ready 15 mins before you time slot. 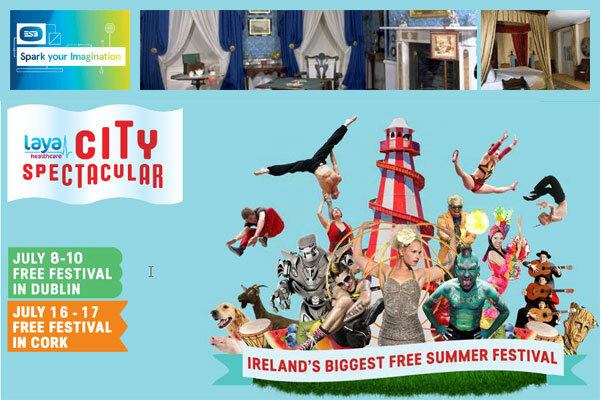 To make a final booking please contact Dominic on 087 3130504 on OR BEFORE Monday EVENING . Time sheet is filling up . Green fee is ?30 for members and ?35 for visitors or former members.This includes your meal as you come in off the course. To contact the club ring 045 441714 . So make that call ring Dominic on 087 3130504 now and we have as most welcoming visitors section. Leo Martin Doherty RIP- brother of Harry Doherty Civil Eng. Mgr. Donegal Stns. Funeral leaving his home on Saturday 9th July at 10.20am to St. Mary’s Church, Ardmore, Derry for Requiem Mass at 11.00am. Interment afterwards in the adjoining cemetery. Family flowers only, donations if wished to Foyle Hospice, 61 Culmore Road, Derry. Our Thoughts & Prayers are with Harry & his Family at this sad time. Scared Heart of Jesus have mercy on his soul. Our Lady of Lourdes intercede for him. It is with deep regret that I inform you of the death of Vincent Rocke, father of our colleague Mick Rocke, G&WM. Reposing at Grogan’s Funeral Home, Tuam this evening (Friday 8th) from 6pm. Removal at 8pm to the Cathedral of the Assumption. Mass on Saturday at 11am. Funeral afterwards to the New Cemetery Killererin. Our thoughts and prayers are with Mick and his family on this sad occasion. 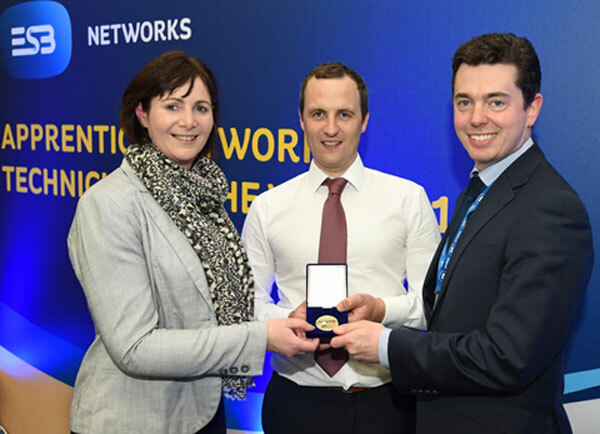 In May, Kevin O’Sullivan from Macroom Co Cork was announced as this year’s ESB Networks Apprentice Network Technician of the Year at the annual event hosted by the National Training Centre in Portlaoise. This event involved the successful completion of a series of tasks in a high-pressure setting. 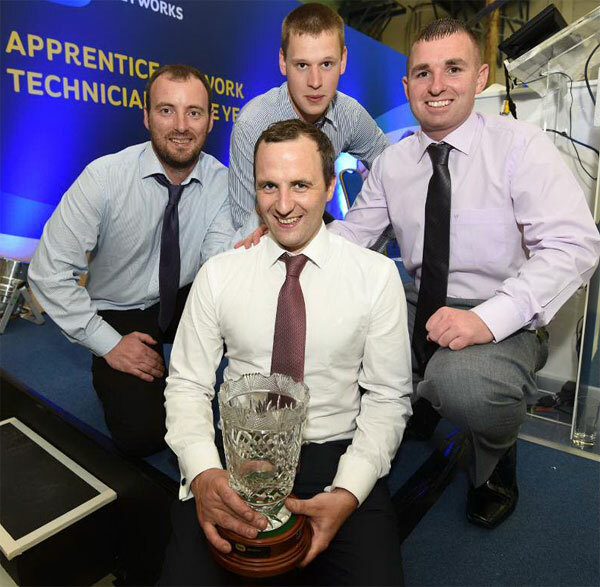 Kevin won out against three other finalists Gabriel Gillespie (Donegal), David Kenny (Arklow) and Thomas Conway (South Kilkenny). Each of these year 4 Apprentices were shortlisted and engaged in a range of exercises which were assessed by a judging panel and awarded on the day. You can view a short video of this year’s event below. To celebrate the return of ESB Spark Your Imagination at , Number Twenty Nine will be extending our opening hours this weekend. Our doors will be open from 10am – 5pm on Saturday and from 12pm – 5pm on Sunday. Admission to the Museum is free on both days so why not pop in and discover what life was really like beyond the elegant doors of Georgian Dublin and maybe even indulge in some sweet treats in our Tea Room while you’re there! It is with deep regret that I inform you of the death of Elizabeth Foley (nee Ward), mother of our colleague Conor Foley, Procurement, G&WM, Head Office. Reposing on Friday afternoon, July 8th at her home from 4pm to 6pm. Removal on Saturday morning, July 9th, to the church of St. Laurence OToole, Kilmacud arriving at 9.50am for Funeral Mass at 10am, followed by burial at Shanganagh Cemetery. Family flowers only please. Donations, if desired, to Carmona Services. Our thoughts and prayers are with Conor and his family on this sad occasion. It is with deep regret that we wish to inform you of the passing of Jimmy Carroll, brother of Pat Carroll, ESB Roscrea. Reposing at his residence in Rosemount, Roscrea on Thursday evening from 4pm with Rosary at 8pm. Private removal from his residence on Friday morning at 11.30, arriving in St Cronan’s Church Roscrea for Funeral Mass at 12.00. Burial afterwards in the adjoining cemetery. I would like to thank all my friends and colleagues who attended my retirement celebrations on Friday last and contributed so generously to my presentation. It was a most enjoyable and memorable evening for me and my family. I would also like to thank those who sent cards and texts and made calls wishing me well. I wish you all well for the future.